Tasty morsel of a story for you this sunny Friday – see you at the Berkeley! For my mum’s birthday, I got her an Alexander McQueen dress, a Fendi handbag and shoes by Christian Louboutin. She found the dress delicious, the handbag divine and the sparkly stilettos literally mouth-watering. Extravagant, moi? 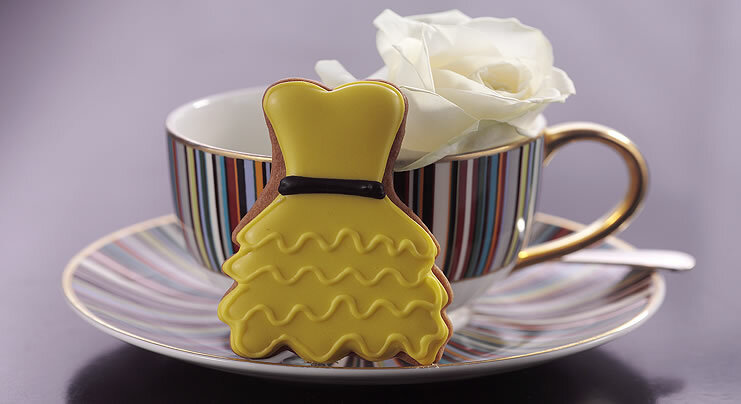 Yes, well, sadly these weren’t actual garments but cakes inspired by high fashion that the Berkeley Hotel in Knightsbridge serves up for what it calls Prêt-à-Portea. Gastronomes with a taste for fashion can sample pastries that pay homage to Philip Treacy, Paul Smith, Zac Posen, Alice Temperley and living shoe god Manolo Blahnik, as well as the labels mentioned above. The intricately-made delicacies were so eye-catching it seemed a shame to eat them. Nevertheless, we forced ourselves and were delighted when the three-tiered cake stand with stripy porcelain plates by Paul Smith was replenished. Tea was served in matching teapots and cups – I drank a delicious low-caffeine brew called African Amber while my mother sipped English breakfast – but our thirst had already been somewhat satisfied by two very large glasses of champagne. As well as cakes ad libendum, the price of tea at the Berkeley included a steady supply of savoury items: tiny sandwiches, rolls and various other amuse-bouches. The designer-inspired sweet treats were, however, the star attraction, much to the enjoyment of my mother who, if asked to name her religion, would no doubt cite “clothes shopping”. She lives in Paris and has repeatedly said that, when the time comes, she wants her ashes scattered into the atrium of Galeries Lafayette department store, her second home. “He did it after his mother died,” I replied. Something about the innocent way in which she asked the question warned me that I was on dangerous ground. How should I respond? “You’re right, what an over-reaction!” seemed too harsh, especially on her birthday. But did she really expect me to answer: “I totally empathise: life without you, mother, would be meaningless and empty.”? After all who, if not her gay son, is going to sprinkle her remains over Parisian shoppers when she is gone? The truth lay somewhere in-between. But I’d had too much champagne to negotiate my way through the emotional minefield into which my mother had drawn me, so in the end I fudged it. And there indeed stood the ginger former duchess, intent on drowning her sorrow at not being invited to William and Kate’s wedding in a sea of designer pastries. Fergie sat behind us with a group of friends. We failed to spot any other celebrities and fell to speculating as to how on earth the two teenage schoolgirls sitting near us could afford to come to the Berkeley for tea. Not that we were jealous! Despite our own lack of celebrity status, the hotel staff treated us impeccably, even when we stayed well beyond 6pm and hogged our seats as people in evening dress filtered into the lounge area for aperitifs and cocktails. My only criticism would be that they made us wait rather too long for our gift box full of yet more couture cakes. Thankfully, none of them was designed by John Galliano. ← Liberty: online roll-out going marvellously. Purrrr….